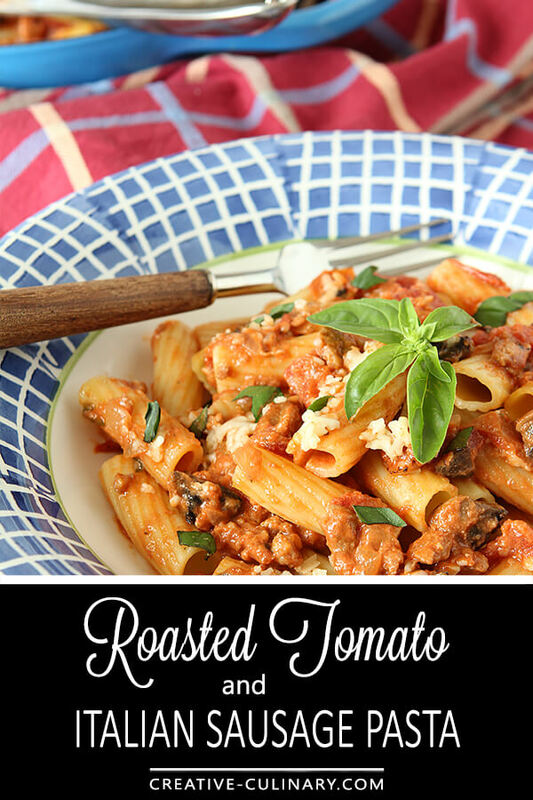 Roasted Tomato and Italian Sausage Pasta with Cream is an easy and delicious pasta dish that is a great use for homegrown tomatoes and basil in the summer; try finding roasted Italian tomatoes that are canned for the winter. While my summer cooking is primarily trying to make things on the grill; there are some things I have to have that require a bit of indoor cooking. I try to limit oven time to mornings when the house is cool after a Colorado night where the temp always falls into the 60 degree range and that’s what I did with this dish last week. I roasted the homegrown tomatoes (not mine sadly) in the morning and then finished the dish later in the day for dinner. While I might most often think of this as something you would enjoy in the winter too; for me it’s a summer must have with fresh tomatoes and basil from the garden (yes MY garden…I am on top of something!). I’m growing some larger tomatoes this year so that I can roast a few more but at the moment I’m wondering the benefit of that effort. At least with cherry tomatoes I would be picking them now; I’m betting I have another month before the ones in my garden are ready. Next year I am going to go crazy with grow lights and shelves in the basement and get a head start; I’ve done it before and I’m ready to try again. I love tomatoes so much and nothing compares to homegrown so I have to enjoy tons of them during the summer while I can. 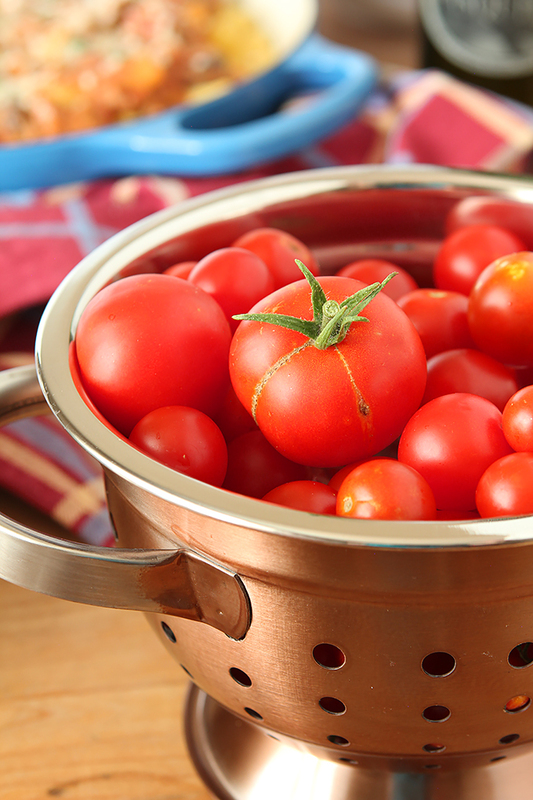 Winter means canned tomatoes only and while they can be good…well, you know they’re not the same. You know what’s difficult sometimes? I made this dish last week and had some friends here for dinner; we had pasta and garlic bread and that was it. It was devoured so no leftovers. Now I’m sad; having to put this post together and be reminded of how delicious it was makes getting it done difficult…I’m hungry! I’m starving and I think what I have to look forward to tonight is a cheese and tomato sandwich. So not the same is it? 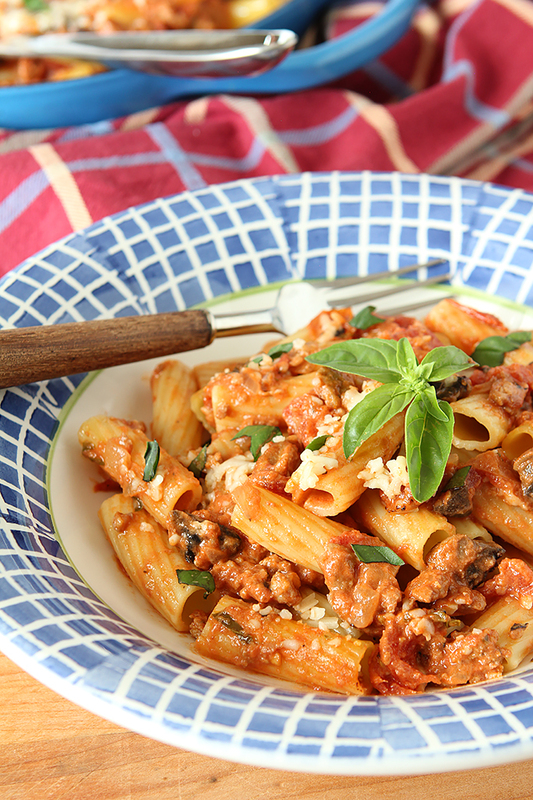 Roasted Tomato and Italian Sausage Pasta in Cream is super easy to make and packed with flavor. 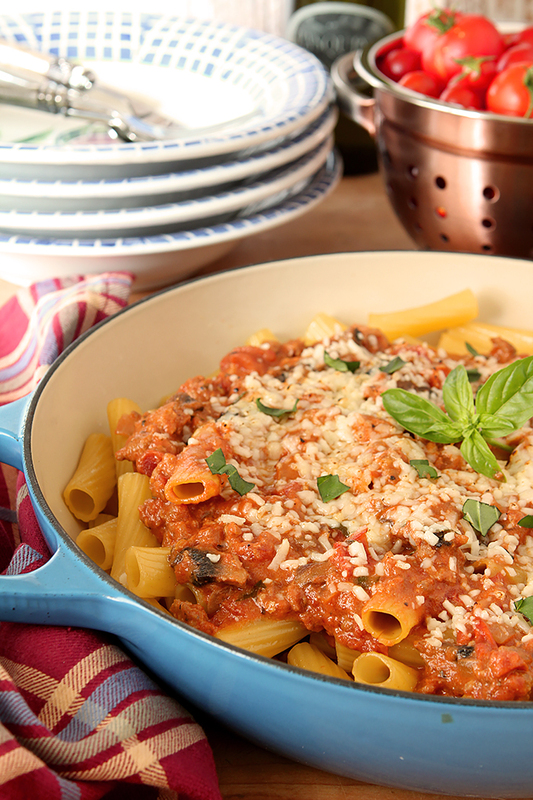 The addition of Italian Sausage makes this incredibly filling! Preheat your oven to about 450 degrees F.
Put the tomatoes on top of the cookie sheet; place in the oven. Cook for about 15 to 20 minutes, it should start to char the outside of the tomatoes. Take tongs and flip the tomatoes over, cook for another 10 to 15 minutes. You want the outside to be charred and the tomatoes to soften but not get mushy. Remove from the oven and transfer the tomatoes to a ziploc bag. Seal it up and allow them to cool for about 30 minutes or so. Take the tomatoes out and peel off the charred skin. Remove the tops and chop the tomatoes roughly. Cook your pasta in boiling, salted water according to the package minus one minute. Melt 2 Tbsp of butter in a large skillet. Add the onions and saute for about 4 to 5 minutes. Add the garlic and the roasted tomatoes and cook for about 3 to 4 minutes more. Remove the skillet from the heat and carefully transfer the ingredients to a food processor. Pulse until mixed but slightly chunky. Add the Italian sausage to the pan and cook until browned; drain any excess fat. Heat the remaining butter (2 tablespoons) in the same skillet over medium high heat, then transfer the ingredients from the food processor back into the pan with the cooked sausage, tomato sauce, red pepper flakes, salt and pepper and cook until it all starts to bubble and come together while you stir. Add the heavy cream and stir to combine well. Drain pasta in a colander, reserving about ½ cup of pasta water and put the cooked pasta into your skillet. Continue to cook until all of the ingredients are mixed thoroughly. Add a little pasta water if necessary if the mixture is too thick. Serve topped with shaved Parmesan and chopped Basil. This pasta recipe is a KEEPER! My mouth waters just thinking about it. Not only the adults loved it, but the grandkids (5 and 13) loved it, too. In fact they fought over the leftovers the next day. Thanks so much for sharing this dish. Thank YOU Betty for taking the time to let me know you loved it too; it’s so nice to get feedback when I share something I love! This looks delicious. Ive never tried italian sausage. Its not very common in our coutry but saw it in the supermarket the other day. I think i’ll give it a try…thanx for this. Love pasta! One of those dishes we have at least once a week. This looks good — Italian sausage is so good, isn’t it? And heavenly with roasted tomatoes. Love the addition of the cream, too. Thanks!